Do the people who purchase your books in a digital format have different buying habits than those who prefer your physical books? How short is your work? It’s a lot easier to give away a short story or sell it for $0.99 cents to $2.99 and have a happy customer than to sell them a pamphlet for (at a minimum) $3.59, assuming they are a member of Amazon Prime and can get free shipping. How long is your work? At the other end of the spectrum, it can be a lot easier to read a long book in digital than print, and you can actually purchase “bundled” books that couldn’t really be printed as one volume. How much clutter does your customer have in their life? Sometimes, the reading experience has nothing to do with the purchasing decision. Is your book specifically suited to print? Workbooks, full-color artistic books, or books with a lot of tables, diagrams or fine-detail in the art may be better candidates to have in hand. Is your book a collector’s item? Books signed by the author will almost always sell better in print. Is your book going to be a gift for another? Both print and digital can be given as gifts, but at least for the next few years I expect that this market will favor print versions. This isn’t to say you should choose one over another; I also discuss my general game plan for when I’ll put out a Kindle book and when I’ll put out a print version, and sometimes it’s worth having a print version even if it rarely sells. Also, thank you to Leary Gates of the Reinventure Me podcast, the Enlightening Podcast and Tedjitsu for the 5-star reviews in iTunes! I really appreciate it. If you’d like to leave your own review, you can do so on iTunes or Stitcher, depending on where you listen to the show. Do the people who purchase your books in a digital format have different buying habits than those who prefer your physical books? That’s the topic for today’s episode. My name is Blaine Moore, and you are listening to the Modern Publishing Podcast, where we discuss everything about getting your message out into the world with the technology and markets available in today’s day and age. You can access a transcript of today’s episode and all of the show notes by going to mppcast.com/14. So how do the demographics differ between digital and physical book purchasers? This is another question where the real answer is going to be niche-specific. Just because people in one niche prefer buying kindle books, for example, doesn’t mean that even the same person wouldn’t prefer a physical book on an unrelated topic. First, as a general rule it’s easier to sell shorter works on their own in a digital format. I imagine that a lot of this deals with the cost; you can’t cost-effectively sell a short story in paperback. If you use CreateSpace to print your books, it would be a hard sell for somebody buying a 10,000 word short story for $3.59 (assuming that you don’t mind selling it without earning any royalties) because they are going to feel like they were ripped off when they are holding that book in their hands. Theoretically, you could sell it for $2.69 in the CreateSpace marketplace without earning any royalties but then they still have to pay a few dollars in shipping too! The minimum cost for a printed book in CreateSpace is $2.15 and you have to price it with a 40% royalty on top of that to Amazon. Using a Kindle and selling through KDP, however, you can sell the same story for $0.99 cents or even $2.99 and it doesn’t seem like it’s such a bad deal. Depending on your marketing strategy, you can potentially give the story away for free without encurring a huge amount of overhead. Even if they do pay $2.99 for your story, your reader is going to have a better experience overall because they aren’t going to walk away with a tiny pamphlet that shouts out to them how short the story is and how cheap the delivery medium feels. 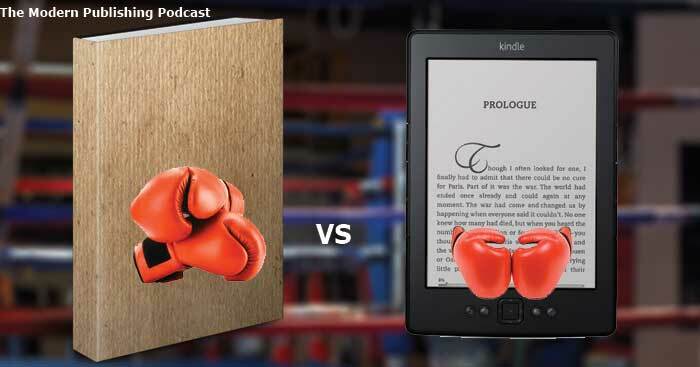 Even though it’s the same story on their Kindle, how short it is isn’t going to be screaming at them every time they handle your “book” and they’ll be able to enjoy the story for what it is. Another reason somebody may prefer a digital work is that it’s much easier to consume longer works on the Kindle or a tablet or phone. For example, I bought Tim Ferriss’s latest book some time back, the 4-Hour Chef, and it took me a lot longer to read through than most books would. My reading time was limited by the sheer mass of the book…it was too big to travel with, or to read anywhere where I was trying to lay back. My Kindle is much lighter, so especially for books that are very long and require a lot of pages (or for books in a series where you can just carry one file around with you) I far prefer having the smaller form factor. I would say that the majority of my reading happens on my relatively older Kindle 3 e-ink reader, followed by my Kindle Fire, and only then do magazines or physical books even get considered. I would be surprised if others who have ebook readers feel much different. Another reason that somebody may prefer digital books has nothing to do with the reading experience itself. Some people just want to avoid clutter, and digital books are far better for eliminating or avoiding clutter. As the owner of a very small home made smaller with my now 2-year-old daughter and all the “stuff” that that entails, I’ve already given up my office for a nursery and have most of my library boxed up in the basement. I’ve actually had some of my favorite authors offer to send me a signed copy of any of their books, and I turned them down as I already own the books digitally and just don’t want to find somewhere to store the book in my home. While I still love the idea of having a “library room” someday, I much prefer the ease of just copying a file onto one of my Kindles or having it download directly from Amazon. Of course, some books are better suited to print. Workbooks, full-color artistic books or books with a lot of diagrams, tables or fine detail in the artwork – these are books that are probably going to do better in print. You’ll still do okay digitally with any of those, especially as tablets and ereaders get better over time, but at least for the next few years I expect that these types of books will continue to sell better in print. Both print and digital books can also make for good gifts, but in general I suspect that physical books are still gifted more often than digital books at this point in time. So, realistically, how does that affect how you offer your books? Since it’s so cheap to hit both avenues, I usually would opt to distribute in both arenas. You can usually get to market faster using a digital version, but making the book available in print can have benefits above and beyond just making it available for those who prefer something they can hold. For example, if you make sure that the books are mapped together in Amazon, then you can set a price anchor for your kindle book by displaying the print price right next to it and showing your readers what a great deal it can be. That can be worth it even if the physical book never sells more than a few copies! An added bonus is that reviews for a digital version will appear on the physical book listing and vice versa. In general, for books that I’m looking to actually sell through online marketplaces and that I’m not just using as lead generation (for which I’ll generally want physical copies to hand out to people) I will usually opt for Kindle-only at first, because it is a bit easier and faster to get the book up and available to make money. I can also experiment with shorter works, or bundling longer works together to a point where printing a physical book would not make much sense. If a book doesn’t do well on Kindle, there may not be any reason to print a physical book, so it works as a good test-bed to see which titles deserve extra attention. But, I guess the best advice I can give is to see what medium you prefer working in first, and to test your market and respond accordingly if there is a discrepancy between where your sales are coming from. Blaine wastes no time delivering helpful nuggets about publishing. I like not having to wade through a podcast to get to the meat. Looking forward to listening to many more. Enlightening Podcast also left a 5 star review, praising my “Methods For Writing Your Next Book”. Great advice on publishing your book. I’m in the middle of writing a book right now so I’m happy I stumbled upon this podcast. Blaine gives straight forward advice on publishing and dealing with all the the details afterward like how to handle negative book reviews. Keep it up Blaine! All of the notes from this episode and links to anything I spoke about can be found by going to mppcast.com/14. In episode 15, I will be talking about my experiences recording audiobooks for clients, and will walk through my setup and equipment so you can see what sort of workflow I use to record my books. If you have any questions about audiobooks or the process for recording one yourself, please leave a comment on the show notes page or send me an email and I will answer it in episode 15. Until then, have a great week!